A theater group presented a didactic skit at the female farmers’ festival. The main theme of the theater performance was sustainable agriculture, food security and nutrition by linking it with World Food day. Community children present an educational skit about World Food Day at the Female Farmers’ Festival. 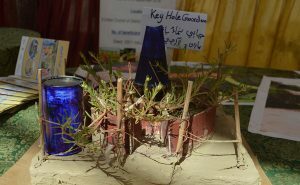 A model displaying a type of kitchen garden. A beneficiary of the food & security project, Zainab, residing in Fazal Wadho village of UC Khairpur Gambo, District Badin shares her kitchen garden. 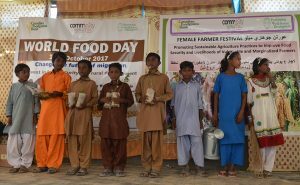 Many rural communities in Badin have benefited from Community World Service Asia’s and CFGB’s Food security project, which started in 2015. This initiative seeks to ensure food security and sustainability in rural areas by providing villagers innovative farming skills. By doing this, they are positively impacting the community sustainably by guiding them on how to acquire their own necessities rather than merely distributing tangible products such as food kits or shelters. Through the project, villagers are encouraged to become self-sufficient instead of dependent on external assistance. 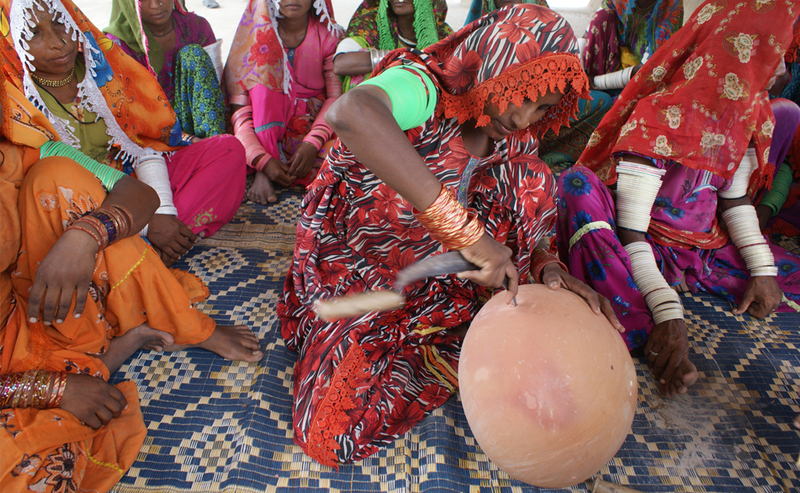 Using various methods, the project is equipping rural communities of Badin with essential knowledge on health, nutrition, and sustainable agriculture. The project recently held a Farmers Festival for women farmers to celebrate World Food Day and the achievements of these farmers over the last two years. The festival featured many performances, including poem recitals, song competitions, and two didactic dramas enacted by local children and the village’s theater group, which has been formed as part of Community World Service Asia’s projects in the area. More than three hundred and fifty women from Union Council Khairpur Gambo and Pangario of Badin and fifteen elementary school students from the same area participated in the festival. The children (students) enlightened the attendees at the festival on the importance of kitchen gardening, tree plantations, good nutrition, environment conservation and the history of World Food Day through tableau performances. Representatives from the National Rural Support Programme (NRSP), Participatory Village Development Programme (PVDP), Arche Nova, Society for Safe Environment and Welfare of Agrarians in Pakistan (SSEWA-Pak) and Local Support Organizations (LSOs) also participated at the festival. remarked, Fozia Iftikar one of the farmers at the festival. After every six months, my husband sells whatever crop he has been growing on the land, and we live off the profits. However, we have to wait for that income since some crops, like cotton and peppers, take six months until they are ready to sell. Fozia is not able to do full-time work because of her young children, but she does sewing at home. She rarely receives sewing commissions, and when she does, they are usually from relatives. Thus, the family’s main source of income is through her husband’s farming. The family is dependent on the water and weather for their crop’s wellbeing, creating an unstable financial foundation for the family. We learn a lot from the project team who taught us about health and hygiene. Because of this teaching, my family has been able to prosper. We didn’t know anything about growing vegetables until they taught us about it. My family did not pay any attention to health, but now we are all very interested in this matter. Community World Service Asia holds teaching sessions in Fozia’s village once or twice a month. The staff teaches the community members about agricultural techniques so that kitchen gardeners will be able to maintain their produce. Sessions for men on fishing and other food-gaining practices are also held. 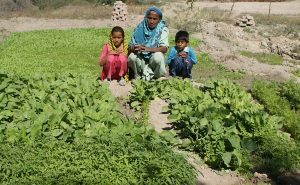 Fozia confidently asserted that it is easy to maintain her kitchen garden, and she appreciates the change—in terms of finances and health—that it has brought in her family. I like eating my freshly grown vegetables. The healthiest diet for my family is to eat our homegrown vegetables. Ever since Fozia’s family has been eating homegrown vegetables, the family has had some extra money, initially used to purchase vegetables. They use it on other household necessities, such as oil, sugar, clothes, and the children’s school books. Moreover, when Fozia’s kitchen garden has excess vegetables, she either sells them to generate more income, or she gives them to people who do not have any food. Fozia has also noticed that her family’s health has improved. She estimates that in a year, there may be one or two illnesses among her children, but no more than that. Furthermore, she noted that her family is much more energetic than they were when they ate vegetables from town. Fozia’s children did not like eating vegetables before, so the family often ate lentils, the children’s favorite meal. Fozia did not know the nutritional value of vegetable before. However, after Community World Service Asia began holding sessions in her village, she discovered that their diet was unhealthy. Now, the family consumes vegetables at least once a day rather than only once or twice a week as they did previously. After Fozia began attending the sustainable farming sessions, her family has much more variety in their diet. The vegetables that we used to buy in town are grown with polluted water, and they were always several days old when we bought them. On the other hand, the water I use to grow my vegetables at home is clean, safe water. Our homegrown vegetables are much fresher than the ones in town. We grow all sorts of vegetables at home, such as tomatoes, cauliflowers, pumpkins, squash, and many more. Homegrown food is optimal for my family’s wellbeing. The kitchen gardening training build our skills and knowledge in growing vegetables at home. Before this, we always had to buy vegetables from the nearby market which was not only tasteless but also difficult to purchase due to high prices. With the kitchen gardening training and vegetable seeds provided by the livelihoods team, we are no more dependent on our men to fetch vegetables from the nearby market. She further added that the nutrition training also helped enhance inclination towards taking healthy and balanced diets through the food that is available to them. Kitchen gardening is a ray of hope for me and my family. My family enjoys fresh and chemical free vegetables from our garden. In addition, I have earned PKR 35000 by selling fresh vegetables in nearby markets. This has improved our standard of living. a staff member of the project assured. Hundred percent of the target families have been trained in nutrition and kitchen gardening, providing fresh vegetables at the doorstep of villagers. Families were provided with vegetables seeds to grow in their kitchen gardens. This availability of vegetable at their doorstep not only increased diversity in their meals but also enhanced the quality and quantity of food consumption of the targeted families. A periodic survey report revealed that acceptable food consumption score of the targeted families have increased up to 70% at the end of second year of the project implementation. This was at 43 % initially. Through the teaching sessions in villages, the food security project staff hopes to see continued development in the communities of Badin. 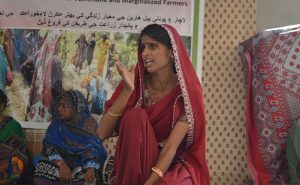 The change evidenced in the lives of village women, such as Fozia Iftikhar, reveals that the project is bringing the world one step closer to achieving the second sustainable development goal: Zero Hunger.